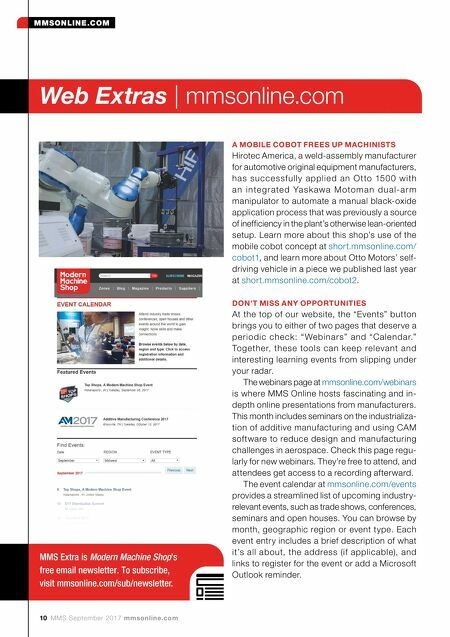 MMSONLINE.COM 10 MMS September 2017 mmsonline.com MMSONLINE.COM Web Extras | mmsonline.com A MOBILE COBOT FREES UP MACHINISTS Hirotec America, a weld-assembly manufacturer for automotive original equipment manufacturers, ha s suc c e s sf ull y a pplie d a n O t to 150 0 w ith a n i n te g r a te d Ya s k awa M oto m a n d u a l - a r m manipulator to automate a manual black-oxide application process that was previously a source of inefficiency in the plant's otherwise lean-oriented setup. Learn more about this shop's use of the mobile cobot concept at short.mmsonline.com/ cobot1 , and learn more about Otto Motors' self- driving vehicle in a piece we published last year at short.mmsonline.com/cobot2 . DON'T MISS ANY OPPORTUNITIES At the top of our website, the "Events" button brings you to either of two pages that deserve a pe riodic che ck: " We binars" and "Cale ndar." Together, these tools can keep relevant and interesting learning events from slipping under your radar. The webinars page at mmsonline.com/webinars is where MMS Online hosts fascinating and in- depth online presentations from manufacturers. This month includes seminars on the industrializa- tion of additive manufacturing and using CAM software to reduce design and manufacturing challenges in aerospace. Check this page regu- larly for new webinars. They're free to attend, and attendees get access to a recording afterward. The event calendar at mmsonline.com/events provides a streamlined list of upcoming industry- relevant events, such as trade shows, conferences, seminars and open houses. You can browse by month, geographic region or event type. Each event entry includes a brief description of what it's all about, the address (if applicable), and links to register for the event or add a Microsoft Outlook reminder. 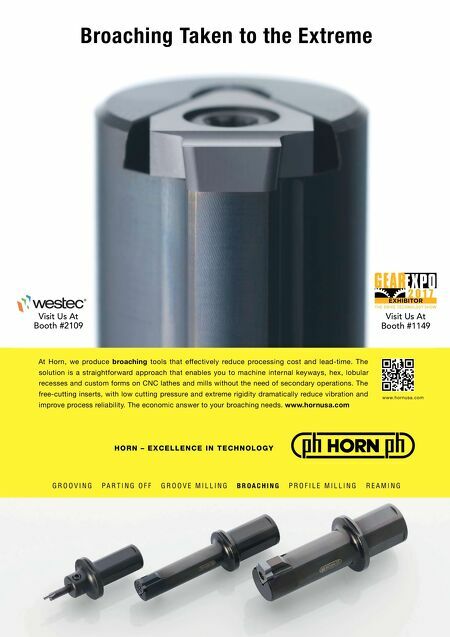 MMS Extra is Modern Machine Shop's free email newsletter. To subscribe, visit mmsonline.com/sub/newsletter.